Heart Foundation mascot ‘Hearty’ dropped in to TopKids Mount Maunganui to celebrate its Gold Healthy Heart Award with Kylahn Hawira-Fuao, Catalina Elgueta Pinto, Rianah Anderson and cook Laura Elgueta. Kumara and chickpea curry, beef chilli, and wholemeal pasta salad with chicken, corn, peas, tomato, broccoli and cheese. Impossible meals to get into a toddler, right? 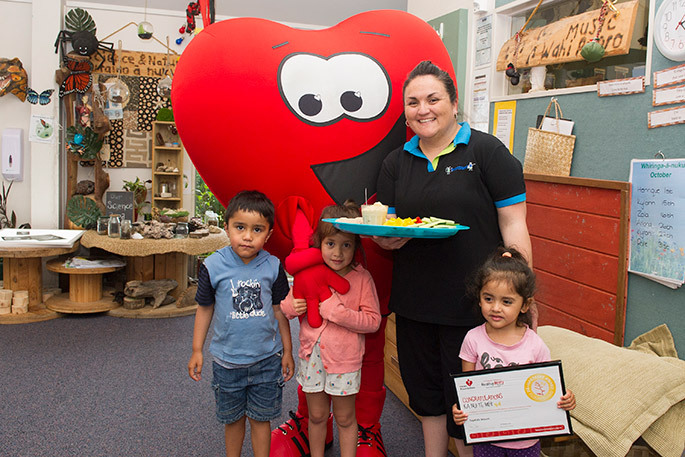 Not at TopKids childcare centre in Mount Maunganui, which has just won the Heart Foundation’s Pa-Harakeke Gold Healthy Heart Award for creating an environment that promotes healthy eating and physical activity for under-fives and their families. The centre provides healthy morning and afternoon teas and lunches for its young charges, rotating its menu on a four-week cycle. The healthy heart award comes just a month after new cook, Laura Elgueta, joined the team. More than 100 children, aged three-months to six-years, attend the centre which offers free ECE hours. Complex manager Nicky Bird says the centre has always promoted healthy eating, but has had a real push in recent weeks. “We cater mainly for working families, and they’re busy,” says Nicky. “I’m a working mum as well, and sometimes the last thing I want to do when I get home is cook. “If I give my kids spaghetti on toast I do it knowing they’ve been eating healthy food during the day. Many of the centre’s recipes are sourced from: www.fuelled4life.org.nz - a Heart Foundation initiative involving the education, health and food industry sectors working together to supply healthier food in schools and early learning services. Laura posts the menu and photographs of the meals to the electronic documentation programme Storypark, to keep parents informed. “They love the new food and so do the kids,” says Nicky.